Ewhurst is a village about 35 miles south west of London on the Surrey Sussex border. Close by is the larger village of Cranleigh and the nearest towns of Guildford, Dorking and Horsham, are each about 10 miles away. The parish of Ewhurst, like many in the southern part of Surrey, is long and thin, stretching some six miles from Pitch Hill in the north to the hamlet of Ellen's Green on the Sussex border in the south, but is less than two miles from east to west. It covers an area of approximately 5,400 acres with a population at present of about 2,500. Above the village Pitch Hill stands out from the Greensand escarpment with commanding views over the Weald to the South Downs. Extending northwards is the Hurtwood, a large area of woodland and common land forming part of the Surrey Hills Area of Outstanding Natural Beauty. Much of the parish, however, is on the Weald Clay, which in ancient times was a vast forest and is still one of the most densely wooded areas of Britain. The name Ewhurst* derives from the Old English 'hyrst', meaning 'wooded-hill', and 'iw' meaning 'yew tree'. In the Natural History and Antiquities of the County of Surrey published in 1719 the antiquarian, John Aubrey notes "the vast quantities of yew trees that formerly abounded here". The first recorded spelling is "Iuherst" in 1179. However, the name is also popularly (but incorrectly) believed to have derived from the word ewe, for a female sheep and the village sign shows a both a ewe-sheep and a yew tree. The sign was erected to commemorate the Coronation of Queen Elizabeth II and also incorporates the Royal Insignia and the date 1953. *There are two other villages called Ewhurst – one in East Sussex near Bodiam (church - St James) and one near Basingstoke in Hampshire (church - St Mary the Virgin). There is also a Ewhurst Manor in the parish of Coneyhurst, West Sussex, which is particularly confusing as there is a Coneyhurst Manor in the parish of Ewhurst, Surrey. After the Romans left, the Weald was still largely uninhabited and wild. The Saxons settled in the sheltered valleys to the north but looked to the Weald as a source of timber and for hunting and grazing stock. At first they would have only journeyed into the forest in the summer months, but gradually small settlements developed and eventually these would have come to be inhabited all the year round. The people who lived in these isolated farmsteads would have still looked to their parent villages to the north for their communal needs and it was much later before a village was established at Ewhurst. Ewhurst is not named in Domesday Book but was part of the Royal Manor of Gumshall. The period following the conquest was a time of much church building and although Ewhurst was sparsely populated, the church was founded around the turn of the 11th / 12th century and stone work in the nave dates from this period. The first reference to Ewhurst is a papal bull of 1179, recording the ‘ecclesiam de Iuherst’ in a list of properties of Merton Priory. Merton held the Advowson (the right to present the rector) until the dissolution of the priory in Reformation. Rectors are recorded from 1223. During the medieval period the colonisation of the Weald, which had begun during Saxon times, intensified. This area did not have a system of open or common field farming, and pastoral activities, such as stock rearing, were more important than cereal growing. From the 14th century we can begin to trace the history of Ewhurst families and houses. Personal names recorded in the taxation records such as lay subsidies and the 1380 Poll Tax include many names that can be associated with surviving place names in Ewhurst, for example, Willemus atte Hull, [Hillhouse] Johannes Wekehurst [Wykehurst], Ricardus atte Ruyde (Ryde House now Oldhouse], Henricus Byldener [Bildens], Alicia Coverworth [Coverwood], Walterus Garlond [Garlands], Ricardus Godebrug [Gadbridge] and many others. The oldest surviving houses in Ewhurst date from the early 1400s, including White Hart House, Hoyle Cottage, Coverwood and Oak Cottage at Ellen’s Green. During this period a new social class emerged. Yeomen were prosperous farmers, who owned their own land, but were below the status of gentlemen. The Rydes of Oldhouse were a typical family of yeoman farmers in the parish. 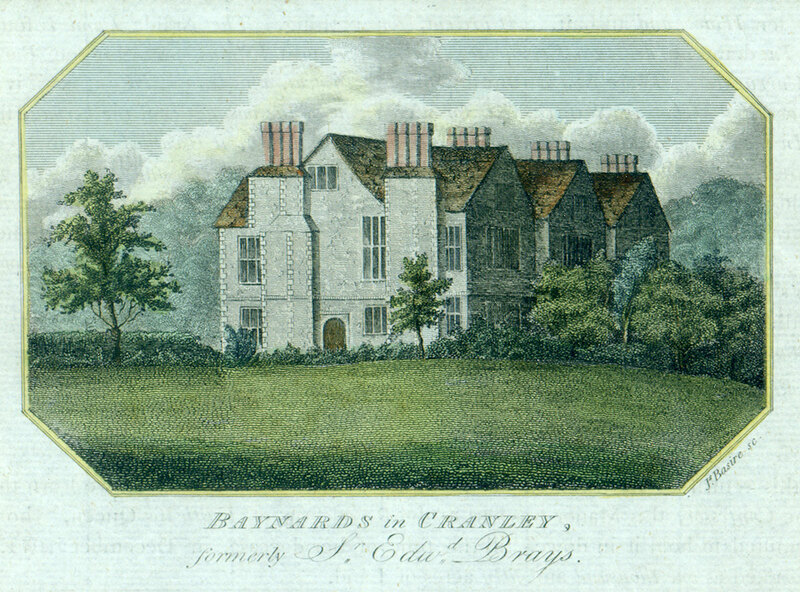 At various times different branches of the family were in possession of Bildens, Longhurst Hill, Coxlands and Mapledrakes. Other prominent local families included the Dendys who were associated with Somersbury, Breach, Woolpit and Downhurst; the Knights of Isemongers, High Edser, Bramblehurst and Slythehurst; and the Hills of Hillhouse, Pollingfold and Rumbeams. But, with the exception of Baynards, there were no gentry. A deer park had been established by William Sydney in 1447, and in 1588, a new mansion house was built by George More. Although there is evidence for a small middle class with personal wealth in the parish, records show the church to be quite poor. But the parish managed to weather the upheaval of the Reformation and the rector, Richard Blachus, held office for the whole period from 1527, before the Dissolution, until 1559, just after the accession of Elizabeth I. The 17th century was a period of much political and religious conflict culminating in the outbreak of Civil War in 1642. In Ewhurst, the rector, William Fuller, was a staunch royalist and the rectory was sequestrated to a puritan minister, John Wing. Mr Wing was not popular with parishioners who refused to pay their tithes, and in turn Mr Wing refused to conduct marriages and baptisms. The loyalties and divisions of the civil war may have lived on into the 19th century as Gertrude Jekyll records the annual fight that took place every Whit Monday between the “Kaffirs” (Cavaliers) of Ewhurst and the “Diamond Tops” (Roundheads) of Rudgwick. The Hearth Tax returns give an insight into the population in the mid 17th century. In 1664, 132 households were listed for Ewhurst which suggests a population of nearly 600 people. 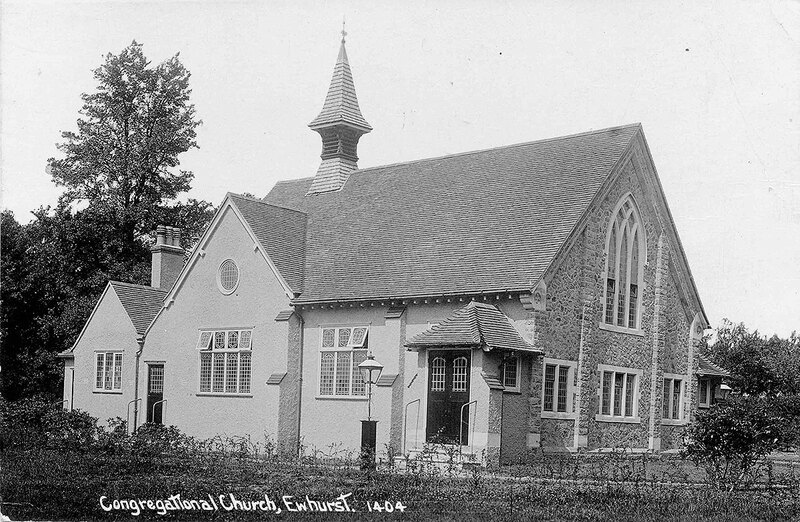 Of the 132 households listed in Ewhurst, 69 were chargeable and 63 were exempt. The number of households with only one hearth is considered to be an indicator of poverty. In Ewhurst this was over half, which places the parish in the bottom quarter of parishes in Surrey for wealth. The agricultural ‘Improvements’ of the 18th century did not benefit the lower levels of society. The parish was not affected by enclosures but the mechanisation of formerly labour intensive agriculture led to much hardship. Poaching and smuggling were rife. Ewhurst Mill and The Windmill Inn are reputed to have been haunts of smugglers. The first census in 1801 recorded the population at 644 people, not many more than the estimated number of 600 of the mid 17th century. 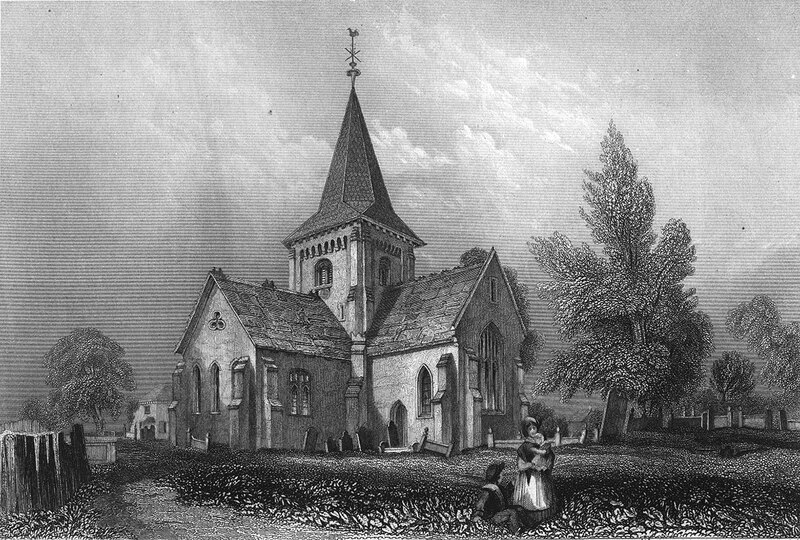 In the first half of the 19th century the parish continued to be very poor. The 1834 Poor Laws grouped parishes together in Unions, and Ewhurst became part of the Hambledon Union. The heavy clay and poor roads contributed to the isolation of the parish. In 1823 William Cobbett, author of ‘Rural Rides’, recounted a journey from Ewhurst to Ockley “From Ewhurst, the first three miles was the deepest clay that I ever saw.....”An attempt had been made in 1818 to provide a turnpike road from Bramley to Rudgwick, passing through Cranleigh and Ellen’s Green. However the trust got heavily into debt and the road was not a success. In 1837 disaster struck when the church spire collapsed destroying much of the chancel and north transept as it fell. 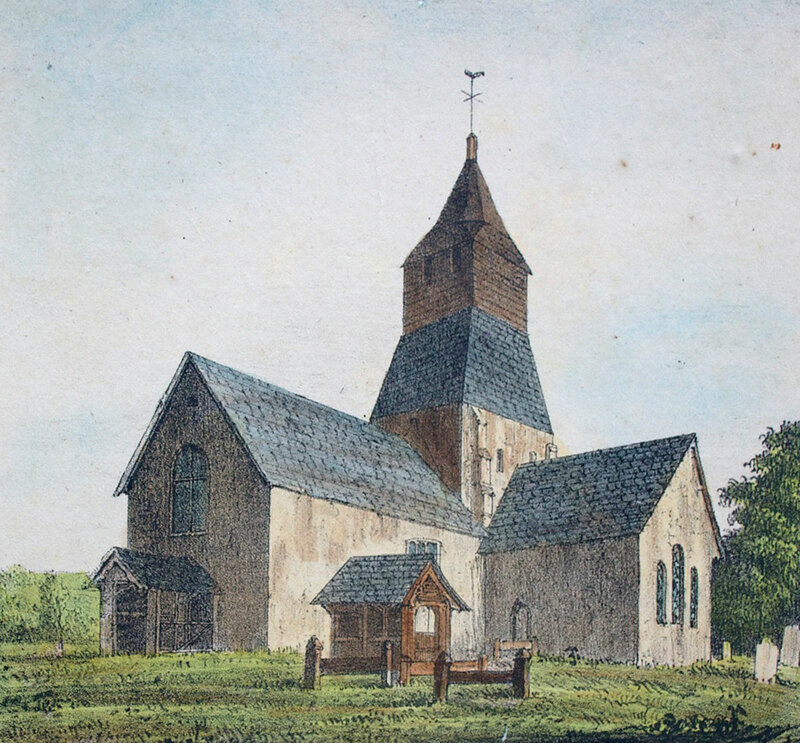 The church was rebuilt to design by Robert Ebbels. 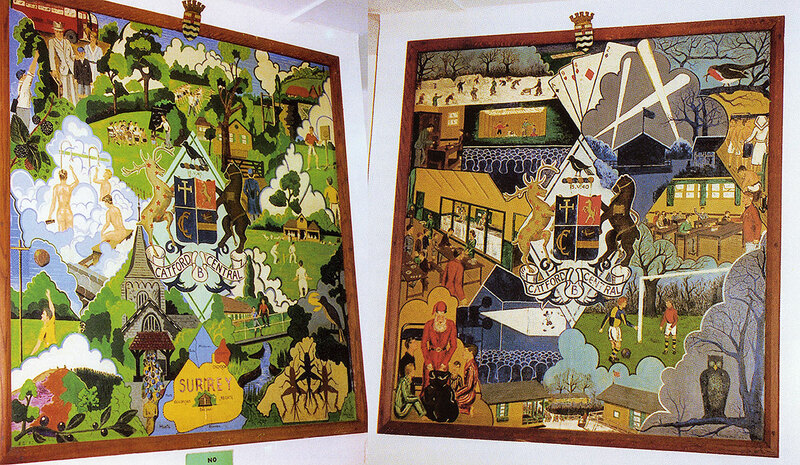 The village remained small and isolated until the late 19th century, when improved communications and a growing appreciation of the beauty of the wild Surrey countryside encouraged many wealthy businessmen and artistic people to move into the area. They commissioned architects to design new houses for them, or restored and enlarged some of the old timber frame houses. A school had been established in the village in 1846 and in 1870 a second school was opened in Ellen’s Green. By the beginning of twentieth century the village was a thriving and self-contained community with many shops and businesses. Census returns show, that whilst agriculture was still important the economy had become more service based and large numbers of people were employed as domestic servants, gardeners, coach men, laundry workers etc. When war broke out in 1914, many young men of the village joined up. The school log book for 2nd September 1914 records “The registers were marked this afternoon five minutes earlier, and all classes were taken out by their respective teachers until 1.50 to give a send-off to the local recruits who left the village in a body today”. As we commemorate the centenary of the events of the First World War, the ‘Ewhurst in the Great War’ posts will give month by month accounts of what was happening in the village during this time. 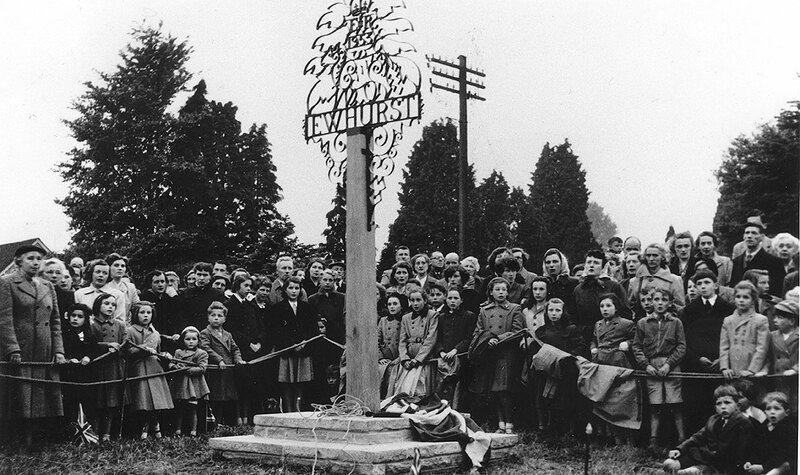 Sayers Croft Camp was built in 1942 and occupied by evacuees from Catford Central School. 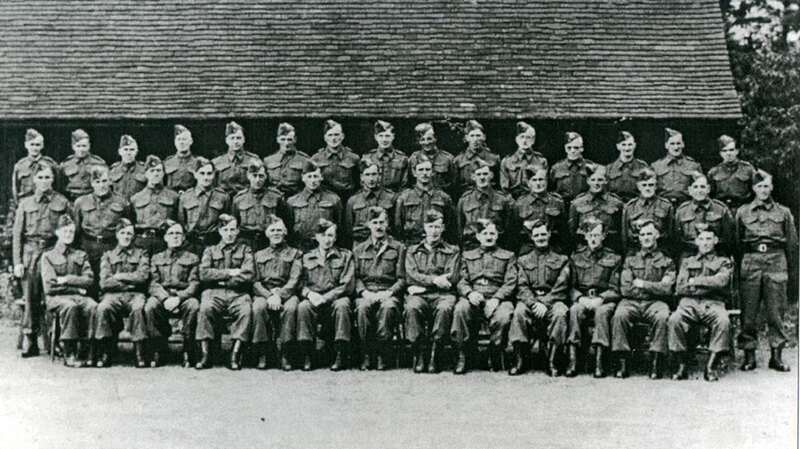 The Home Guard (originally known as the Local Defence Volunteers) was formed in May 1940. 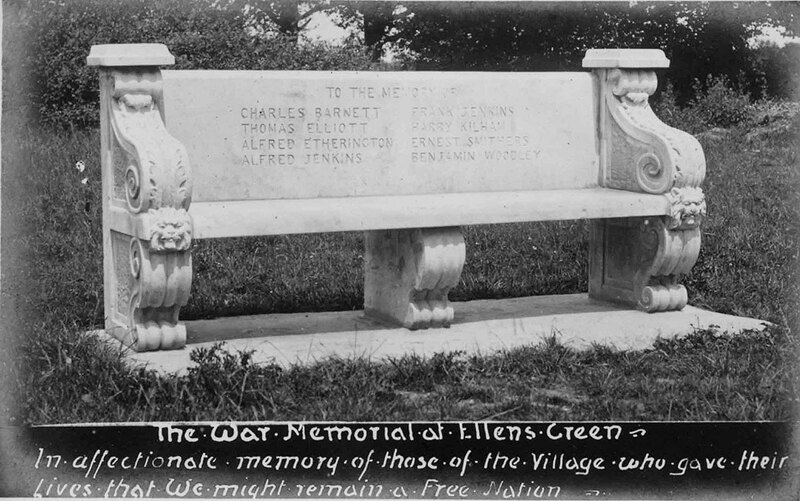 After the war it was decided to remember the fallen by improving recreational facilities. Broomers Field was remodelled as a new recreation ground and in Ellens Green a new Memorial Hall was erected.